High and low risk are the two extremes of machines. An example of a high risk is a classic automated guided vehicle (AGV), as they are usually heavy weight and travel at fast speeds. The heavy weight increases the amount of damage that could occur and the fast speeds increase the likelihood that the AGV could collide with someone and injure them. An example of a low risk is a small light weight mobile automated guided cart (AGC). The AGC’s size and weight make it less capable of causing serious damage. To determine the potential risk of machines, a risk assessment is done. The output of this risk assessment should be a well-reasoned well-informed report, summarized by a Required Performance Level (PLr). What is the performance level (PL) of a machine? The performance level is a discrete level used to specify the ability of the safety related parts of the control system to perform a safety function under foreseeable conditions. 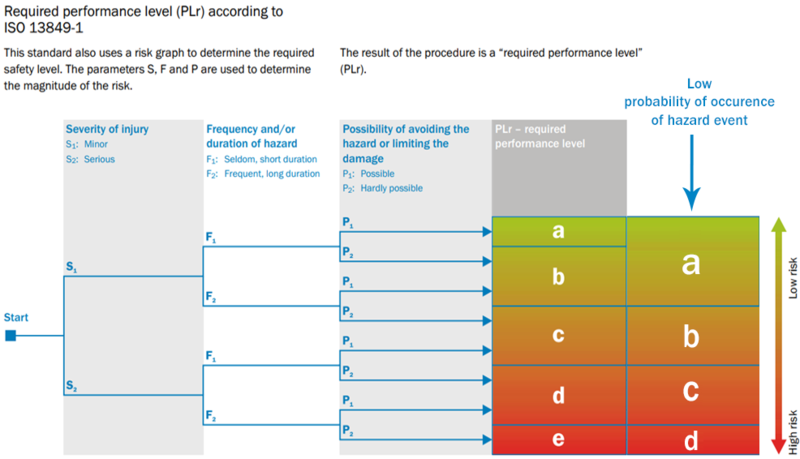 The required performance level (PLr) is the mandatory performance level of a machine to reduce risk. The PL must be greater than or equal to the PLr. The performance level is defined in five discrete steps. It depends on the structure of the control system, the reliability of the components used, the ability to detect faults as well as the resistance to multiple common faults in multiple channel control systems. PLb is a low-risk performance level and recently technology with a PLr b are developing rapidly. 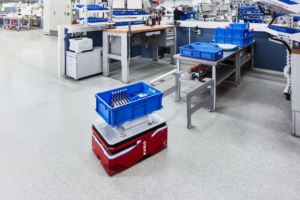 Collaborative robots and small mobile platforms such as, automated guided carts (AGCs) are increasingly used in commercial settings. Further examples of these new developments are the entertainment & care robots for personal & domestic use. These robots tend to be smaller and lighter, as well as move slower which qualifies them as low risk. More people worldwide are trained and educated in safety because of compliance demands enforced by an increasing number of regional and country-specific laws and regulations. For example, Japan trained about 10,000 people since 2005 with skills in risk assessment to achieve necessary workplace safety within their industries. The safety competence has increased over the years to identify and require the appropriate risk reduction for the specific application. In turn, Increased safety competence has led demands for a supply of products that address all safety performance levels. 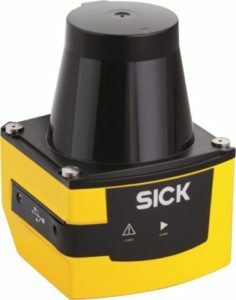 SICK is the first company that provides a safety-related 2D-LiDAR sensor with a performance level b. The safe 2D-LiDAR sensor TiM361S was designed for a wide range of safety application where a performance level b is sufficient. Its efficiency and low sensor weight is helpful for small battery-powered robot solutions. The TiM361S has up to 48 safety evaluated, flexible fields paired with a ≤ 4m safe working range that makes it indispensable for the collision prevention of service robots, mobile platforms, and AGCs. Moreover the TUV certificate according to the EN ISO 13849-1:2015 PL b and machinery directive 2006/42/EC allows the use of the TiM361S in stationary applications for access and presence control (e. g. pick-and-place robots). The TiM361S is perfect for collision prevention of mobile platforms such as, AGCs and service robots that are used for domestic tasks. These robots are lightweight and do not move at very high speeds. If they were to run into a person they would not cause serious damage. These qualities put them at PLr b. The TiM361S directly addresses this safety performance level. TiM361S itself is lightweight and can be easily installed on an AGC or service robot. This blog post is meant as a guideline only and is accurate as of the time of publication. When implementing any safety measures, we recommend consulting with a safety professional.